This covers: spelling mistakes/typos, parsing for conformability to English grammar, appropriate use of punctuation and commas, academic terminology and tone, physical sentence structure and syntax, sentence coherency and flow of ideas, as well as concise usage of language and clearly defined concepts/methods. Note that we do not offer any writing services or any paraphrasing/rewriting services to reduce plagiarism. Payments can be made to our CIMB Bank account for local students in Malaysia, or to our Chase Bank account for international students. 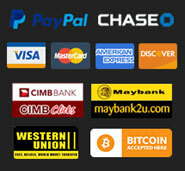 Other payment options include PayPal/credit card, Western Union, MoneyGram and Bitcoin. We do not accept cash. We will send you instructions on how to make a payment along with the quotation. You may request a Receipt and an Official Proofreading Certificate (if required by the publishing journal) any time after payment.